Consult Money Activities & Strategies for additional ideas about teaching money skills. Added on 7/1/06: How Much Is Your Name Worth? 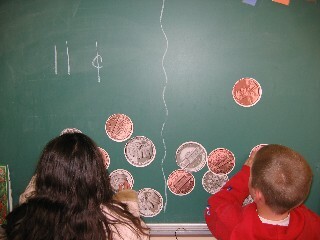 This is a great money activity to start the year as students get to know each other in their new classes. Use this opportunity to sneak in some data analysis skills by graphing the results in a line plot and then using statistical concepts to analyze the results. See How Much Is Your Name Worth? for suggestions to extend this activity.